The Flying Scotsman will be visiting the Keighley & Worth Valley Railway (K&WVR) from March 31 up to and including April 9. It is due to take part in the official re-opening celebrations of the Settle – Carlisle line following its closure for over 12 months. The Flying Scotsman will leave Oxenhope at 8.30am and arrive in Carlisle at around 1pm before returning at 3.30pm meaning that it will be in the city for nearly three hours for fans to view. Its journey will be part of the official reopening of the line after the 500,000 tonne landslip which closed it at Armathwaite, North of Appleby, over a year ago. Tickets have sold out for April 3 to April 9 inclusive, when the Flying Scotsman will be hauling passenger trains between Keighley and Oxenhope each day. But at Ingrow West Station on April 1 and 2 the Flying Scotsman will be on display and in steam between 9am and 6pm each day. K&WVR chairman Matt Stroh, said: "We're still very excited and looking forward to being such a key part of the reopening of the Settle to Carlisle celebrations. "Tickets are still available for the Flying Scotsman Experience' days, and the odd ticket that becomes available where we have a late cancellation is being advertised via Twitter and the railway's Facebook page. "We do ask those coming to photograph or visit to respect private land owners' boundaries and not to trespass on to the railway, so we can enjoy a successful and safe visit of the national collection's most famous locomotive." 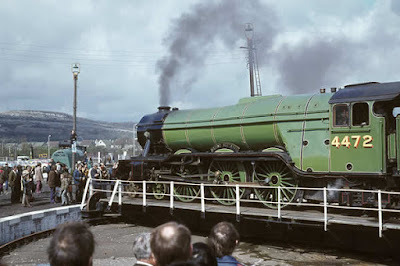 A K&WVR spokesman explained: "The Flying Scotsman Experience will allow access to the locomotive itself and includes a 15 minute interpretive talk about the loco followed by a walk through the cab and, if people wish, the tender. "They can follow in the footsteps of generations of engine-men who passed through on their journey at speed from Kings Cross to Edinburgh. "The whole experience will last up to 40 minutes, and visitors must ensure they arrive at the Ingrow event site in time for the start of their experience." During the weekend of April 1 and 2 there will be refreshments served at Ingrow West, including hot food as well as light snacks and a real ale bar. The Flying Scotsman is back in action following an extensive overhaul. It is being loaned to the K&WVR by the National Railway Museum.